29 years have passed since the clerical regime committed a crime so grave that it has carved a permanent scar on the Iranian people's soul. 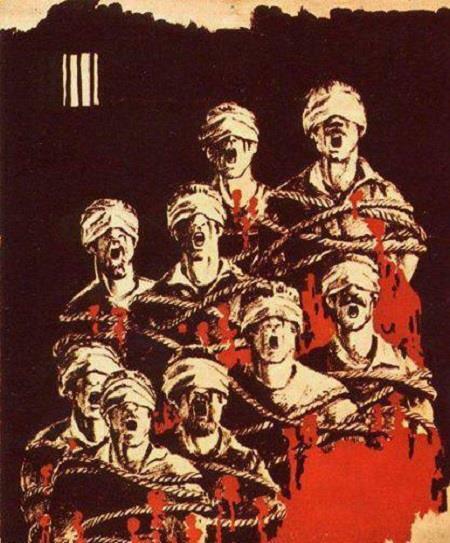 The massacre of 1988. 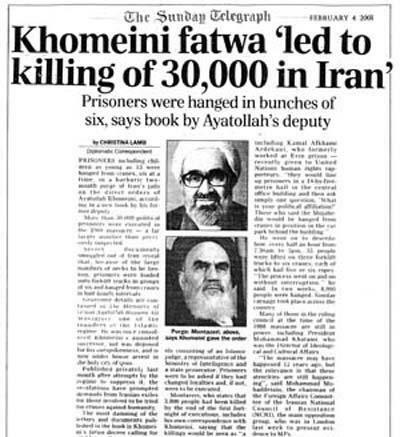 It all started with Khomeini’s death fatwa, all dissidents must die. It boils down to the mullahs fear of losing power, it was very important to get all opposition out of the way, nothing or no-one must threaten the clerical regime. Not then, not now. As the NCRI so nicely revealed the new sanctions have sparked a wave of fear and concerns within the regime. Both media and agents of both factions of the regime are writing about the terrible consequences of adopting these sanctions. And it is true that the sanctions will have terrible consequences for the regime but the sanctions will be a blessing for the Iranian people and all the neighboring countries Iran is currently at war with. The big question this time is, the Iranian regime have been able to work their way around sanctions in the past, will they be able to work through the wave this time? I don’t think so, not this time first of all the regime has not really been able to work around the previous sanctions, this we know because if they had they would never have come to the negotiation table and given up their most important protective shield, a nuclear weapon. Secondly, the sanctions that were put on Iran this time will have much more serious consequences especially since these sanctions will be followed by a changing US policy towards Iran. One thing that will be interesting to see is how the regime will respond to the sanctions. They have already expressed that they think these sanctions are a violation of the spirit of the JCPOA deal. Inside the regime, they are discussing how to face this new situation. They are indirectly talking about revenge. Like one of the lower clerics said «makes us annoyed by new sanctions and its misbehavior about JCPOA, «we should reciprocate by creating» a list of areas and issues that cause Americans to be disturbed.» a Rouhani faction newspaper warns with great fear about this option that Tehran - Washington move expeditiously toward a dangerous accident. 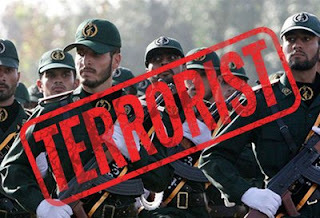 The Iranian resistance, on the other hand, welcomes the sanctions and that they designated the Islamic Revolutionary Guard Corps (IRGC) as a terrorist entity. 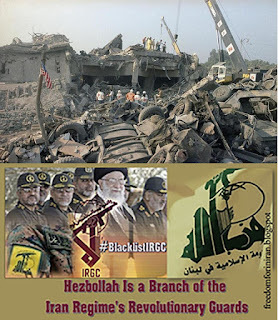 This is an essential step in rectifying the damaging policy of the appeasement that needs to be completed by evicting the IRGC and its affiliated militia particularly from Syria and Iraq as well as the recognition of the Iranian people’s right to overthrow the clerical regime. «Countering Iran’s Destabilizing Activities Act of 2017» the Act underscored that 90 days after the date of enactment of this Act, the President shall impose the sanctions, with respect to the IRGC and foreign persons that are officials, agents or affiliates of the IRGC. All property and interests in possession of designated individuals or entities that are or come within the United States. In fact, all transactions in any shape, size or form with Iran will be illegal. The designation of the IRGC as terrorists is a good first step towards a regime change in Iran, the Iranian people have been telling the world about the necessity of a regime change to secure peace and democracy in Iran and its neighboring countries. The only way to secure that is to support the Iranian resistance in their work to overthrow the Islamic regime. And these sanctions will weaken the already weak regime and a regime change is one step closer. On the 2 year anniversary for the Iran- nuclear deal, it is proven that Iran might not have a nuclear bomb yet but they have used the money released by the deal to wage war in the whole ME region. And they have been working hard to produce a working long-distance ballistic missile that will be capable of carrying a nuclear warhead. On 20, July 2017 Kuwait ordered the Iranian Ambassador to leave Kuwait within 48 days. According to ISNA, Kuwait has been under pressure from Saudi Arabia and that the shutdown of some of the Embassy’s branches is a direct order from Saudi Arabia. But the truth is far from it, the reason for the crackdown on Iranian diplomats is their connection with a convicted terror-cell containing one Iranian man and 22 Kuwaitians. 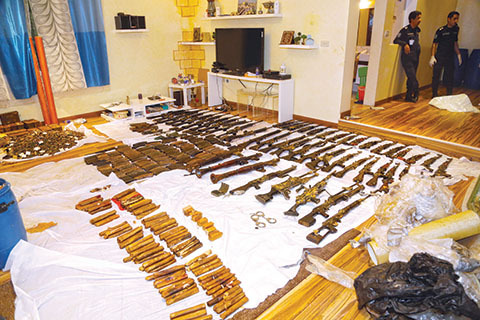 They have been exposed as spies for Iran and Hezbollah and was convicted last year after a cache of guns and explosives was found in a so-called «Abdali cell» in 2015. The crimes of the Iranian regime does not end here. They were behind the AMIA bombing in Argentina on July 18, 1994, that killed 85 people and wounded more than 300. 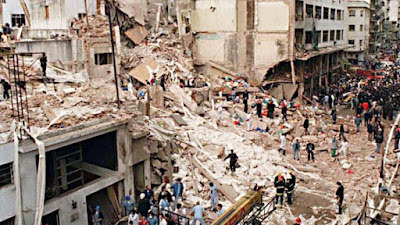 Argentina has held Hezbollah and Iran responsible. The prime suspect for this crime was Ibrahim Hussein Berro, a 21-year-old Hezbollah operative. Other suspects are Imad Mughniyah, Ali Fallahijan, Mohsen Rabbani, Ahmad Reza Asghari, Ahmad Vahidi and Mohsen Rezaee. 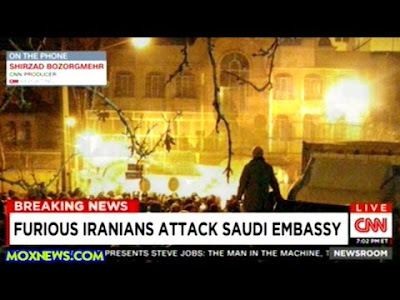 One other crime approved by the Iranian Mullahs is the attack on the Saudi Arabian Embassy in Tehran and the attack on the Saudi Arabian Consulate in Mashhad. Demonstrators were protesting the execution of Sheikh Nimr al-Nimr. The Iranian police did not fulfill Iran's obligations to protect the Saudi embassy from mob violence. This was a clear breach of Article 22 of the Vienna Convention on Diplomatic Relations of 1961, which took effect in 1964. The Article 22 states: «The premises of the mission shall be inviolable. The agents from the receiving state [the host] may not enter them, except with the consent of the head of the mission». In other words, the Iranian police were not upholding the Vienna Convention when they let protesters ransack and set the embassy on fire on Jan 2, 2016. On July 19, 2017, the NCRI wrote that one of the top Kuwaiti officials reported on Monday that 14 Kuwaiti citizens who have been convicted of forming a terror group linked to the Iran regime succeeded to flee into Iran with high-speed boats. These fugitives have been convicted of planning an attack on the Kuwaiti government and sentenced to long-term imprisonment. 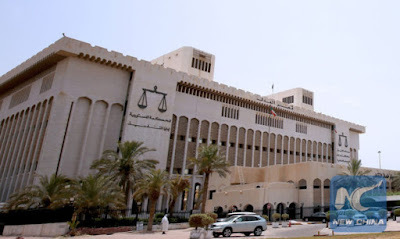 The Supreme Court of Kuwait confirmed that the leader of this terrorist group, Hassan Hajieh associates with Abdolreza Dehghan who is an employee of the Iranian Embassy in Kuwait. 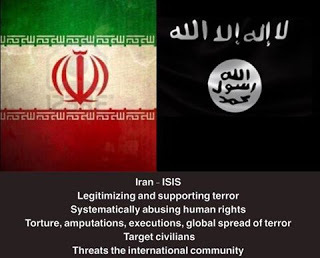 It is no secret that the Iranian regime uses these diplomatic facilities to export terrorism in all countries for example in Iraq they appointed a known terrorist as ambassador, Masjedi, he was IRGC commander at base Ramezan during the Iran-Iraq war in the 1980’s. Masjedi had a key role in the Quds force’s operations after the US invasion in 2003. This appointment is part of a hidden plan by the Iranian regime, they appoint terrorists so that they can commit terror through the Embassy and its personnel. This should be a good enough indication that the Iranian regime breaks all diplomatic laws, they show no respect for foreign Ambassadors and diplomats and should receive the same disrespect from other countries. We, therefore, urge all countries to do as Kuwait and expel Iranian Ambassadors and Diplomats. The Kuwaiti prosecutors have confirmed the connection between Iranian Diplomats and terrorist cells so it should not be a very difficult choice to make. On July 18, 2017, US announced new Iran related sanctions. The sanctions are a response to Iran’s malign activities across the Middle East. Iran continues to support terrorist groups like Hizballah, Hamas and Palestinian Islamic Jihad that is a threat to Israel and the stability in the Middle East. Iran has maintained its steadfast support for the Assad regime. Iran has also provided weapons to Houthis in Yemen that threatens freedom of navigation in the Red Sea and the security of Saudi Arabia. And Iran continues to test and develop ballistic missiles despite warnings. In response to these continued threats from Iran, the US Administration announced to day that it has designated 18 entities and individuals supporting Iran’s ballistic missile program and for supporting Iran’s military procurement or Iran’s Revolutionary Guard Corps (IRGC). Today’s actions were taken pursuant to order (E.O) 13382, which targets proliferators of weapons of mass destruction and their means of delivery and supporters of such activity, as well as (E.O) 13581, which targets transnational criminal organizations. The entity that is in focus in these sanctions is several branches of the IRGC like the Aerospace who does research and development of ballistic missiles. Additionally, the US department of the treasury’s office of foreign assets control (OFAC) designated seven entities and five individuals for engaging in activities in support of Iran’s military procurement or the IRGC, as well as an Iran based transnational criminal organization and three associated persons. One other issue that was addressed in this report was the illegally detained US citizens and other foreigners on fabricated national-security related charges. The US administration calls upon Iran to release U.S. citizens Baquer Namazi, Siamak Namazi, and Xiyue Wang and all other unjustly detained U.S. citizens. The report does also mention Robert Levinson that has been missing for more than a decade, the FBI offers a reward of 5 million Dollars for any information that could lead to Robert’s safe return. The report also addresses Iran’s human rights violations. Like the denial of the freedom of religion or belief as well as other human rights and fundamental freedoms to individuals in Iran. Arbitrary arrest and detention of members of religious minorities and political activists are common as is the use of torture and other forms of abuse in detention. Iran also coerces Afghan refugees into participating in combat in Syria, deporting those who refuse to do so, and it supports militias fighting in Iraq that recruited and used child soldiers. The report concludes with the announcement that the US will continue to aggressively counter Iran’s malign activities in the region and that they will closely monitor Iran’s nuclear activity and make sure that they uphold the JCPOA. 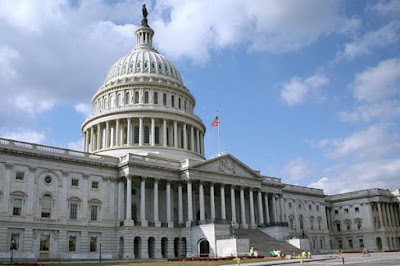 The US will continue to use sanctions to target those who lend support to Iran’s destabilizing behavior and above all, the United States will never allow the regime in Iran to acquire a nuclear weapon. This report upholds Trumps promise to hold Iran accountable for their crimes against human rights and to hold them accountable to the JCPOA. The US will keep a close look at Iran’s ever move, and rest assure if Iran violates any of its restrictions they will have to pay. 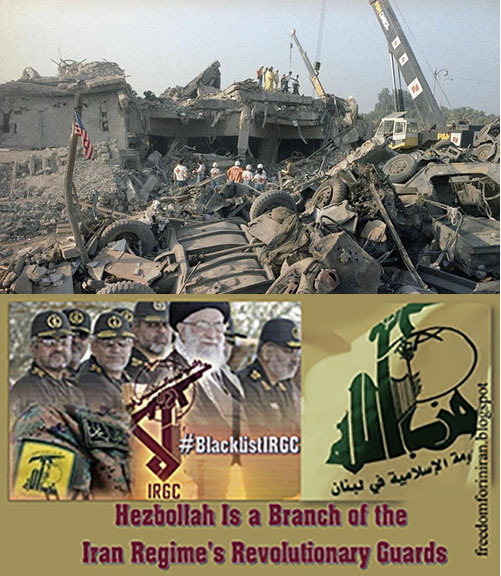 Labels: BlacklistIRGC, Department of state, Iran, IRGC, Middle east, Sanction, Terrorism, U.S.
On July 17, the CFR and their president Richard Haass has invited Javad Zarif, the Iranian regimes foreign minister to speak at the High-Level Political Forum on Sustainable Development and meet counterparts. The problems for Zarif and his regime starts at the first goal, how can anyone expect a regime to work to end poverty when they are the very cause of poverty in Iran? The first step for the regime must be to stop funding terrorism around the Middle East and especially Syria, Iraq, Yemen and Lebanon. But we all know that the regime will never abandon their proxies. 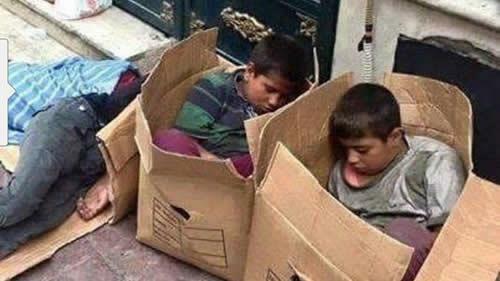 The regime has just ratified the minimum wages in Iran to be 1/3 under the poverty line, that means that most families in Iran live under the poverty line. The mullahs regime is not doing any better on goal 2, in their attempt to get fast money from petrol wells they rerouted rivers and destroyed Iran's bread basket, they turned Irans most fertile area into a desert. Large parts of Iran do not have access to clean drinking water, and it is the failed environmental policy of the regime that is the cause of the drought. The Iranian regime will never be able to uphold goal 3. If they shall have any hope of upholding that they must stop torturing and harassing ordinary people, they must free all political prisoners, to ensure healthy lives the regime must put together a good health care service so that poor mother is not forced to sell their children in order to pay hospital bills. One other thing, how can they ensure peoples well-being when they tense to execute everyone that disagrees with their rule? This regime will never be able to reach goal 5, they just passed a law that forbids women to take off the mandatory hijab in their own cars. This regime has also forbidden women to ride bicycles. One minister went as far as claiming that the drought in Iran is caused by women who refuse to obey hijab laws. Do you really expect that a regime that is capable of this ever will respect and uphold Human Rights? Goal 9. the regime have building cranes but they are used to hang people, there are no cranes available to use to build neither infrastructure nor new buildings. With the points above in mind, we ask you, Mr. Haass please reconsider your invitation of Zarif and respect the victims of this regime. During the 'Free Iran' rally in Paris on July 1, the mood was festive and clearing upbeat, as speakers discussed the movement of MEK members from Iraq to Albania. "Since last July, the Iranian Resistance has hoisted the banner of seeking justice for the victims of the massacre of political prisoners 29 years ago, turning it into the main focus of political discourse in Iran today," said Rajavi. She noted that in the recent Iranian elections, which many speakers called a "sham", that the slogan of the resistance was "No to the executioner, no to the charlatan". It was a slogan that was widely embraced by the Iranian people, and referenced the attempt by Khamenei to elect Raisi, a member of the death Commission in the 1988 massacre. "It is relying on political prisoners, who reaffirmed their support recently for this gathering from the depth of their cells and dungeons. It is relying on women, workers, teachers, professionals, and selfless youths. 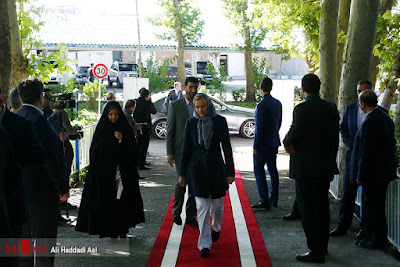 It is relying on their unsparing love and generous support, those who borrow money and sell their houses and properties to help keep this Resistance independent, strong, and solidified," said Rajavi. "The Iranian nation is proud to have created a democratic alternative through resistance and great suffering and sacrifice. This decisive asset,…did not exist at the time of the Shah," said Rajavi. She acknowledged that this left a vacuum that allowed the regime to grow and take root. On July 5th, 2017, there was a well-orchestrated visit by European politicians from 45 different countries, to the notorious Evin prison in Iran. This visit is the latest attempt from the Mullahs regime to repeal claims of human rights abuse in Iranian prisons. The day before the visit, Javad Larijani, the head of the Iranian regime’s so-called «Human Rights Organisation», claimed there are no political prisoners in Iran. 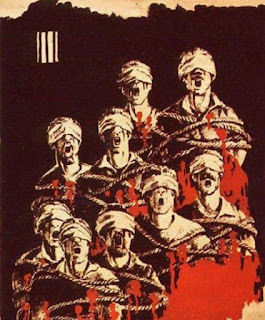 Over a few summer months in 1988, the regime of the Mullahs murdered more than 30 000 political prisoners and buried them in vast mass graves. Up until this day, the perpetrator of this hideous crime has gone unpunished. In fact, most of the members of the death commissions have high ranking positions in the regime today. One very profiled member of the death Commission is Ebrahim Raisi, you will remember him as one of the candidates for this year's sham presidential election. The revelation of his role in the 1988 massacre was one of the reasons Khamenei had to pull him out of the election. The role of Hassan Rouhani, Iran's current president was that of Deputy Commander-in-chief of the regime’s armed forces. In this position, he was fully cognizant of this hideous crime and obviously as in full conformity. He is like all other senior officials of the regime a culprit of this hideous crime. 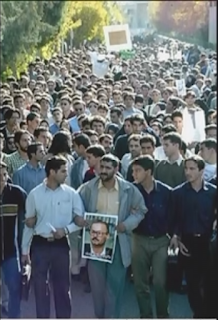 On a hot summer day in 1999, some brave students were peacefully protesting the shutdown of Salam newspaper and parliament's passage of a new law limiting freedom of the press. This is how it all started. Later that day, when the students were sound asleep in their dormitories the attack started, a couple of hours after midnight, plainclothes Basij militia and Ansar-e-Hezbollah stormed the dormitories, broke down doors, smashed furniture and wounded several students and killed at least one. They destroyed student rooms and properties and they threw some of the students out of balconies on the third floor onto the pavement below, crushing their bones and leaving one paralyzed. According to witnesses of that day, 300 people were wounded and they claim 17 students were killed, authorities acknowledge just the death of Ezzat Ebrahim-Nejad. This vicious attack was the spark that led the peaceful protests in University campus onto the streets of Tehran. Approximately 50 000 students participated in the demonstrations and many ordinary Tehran citizens joined them. As days passed the protests spread across Iran and students in other major cities such as Tabriz, Mashhad, Shiraz, and Esfahan joined the uprising. In Tabriz, the police forces entered the universities and brutally attacked students, four students were killed and several students were tortured in custody. Saeed Zeinali disappeared after his arrest by security forces. 18 years later his mother is still waiting for his return. During this time Khatami reported having said: «If you are the people, then I am the enemy of the people.» The true face of the regime was finally revealed. 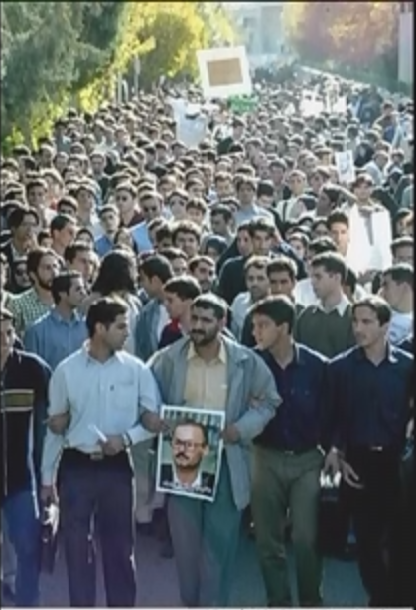 The student uprising on July 9, 1999, is considered to be the first massive uprising initiated by the generation born under the Islamic Republic Regime. This uprising is considered to be a foundation for the Green Movement of 2009. 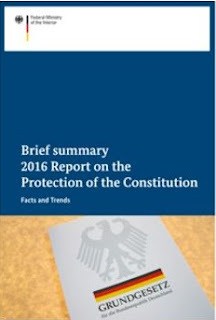 In the annual report from the German Federal Ministry of the Interior 04.07.2017, the threat from Iran is taken seriously, the security officials are advised to follow the activities of the Iranian intelligence services (MOIS) very closely, they are considered a threat to the security of Germany. The report states that the main task for the MOIS is to spy on and suppress opposition movements (Mostly MEK/PMOI) at home and abroad. In addition, the service gathers political, industrial and scientific intelligence in Western countries. On July 3, the Ontario Court upholds the $ 1.7 B judgment against Iran, ruling in favor of American victims of terrorism. This ruling is a major victory for the victims of terrorism and it holds Iran accountable for its support of Hamas and Hezbollah during terror campaigns from the 1980s through 2002. The court rejected the state’s immunity and accused Tehran of trying to derail Canada’s justice for victims of terrorism act. They said that the very fact that a foreign government would engage in the sponsorship of such atrocities as the acts of Hezbollah and Hamas is chilling. To use peaceful legislative means to combat terrorism is entirely consistent with Canadian legal morals. This weekend the Free Iran Gathering was held in Paris, more than 100 000 people participated. Several American politicians attended, one of them was former US ambassador to the UN, John Bolton. John Bolton remarked that the Iranian resistance is the only people that would truly be able to rule Iran instead of the Regime. He continued by saying that there is a viable opposition to the rule of the Ayatollahs and that opposition was present at the Gathering. He also praised Donald Trump’s attitude to the Iranian regime, which has been evident ever since he was on the campaign trail. The US Congress is working towards new economic sanctions against the Iranian Regime. The Iranian regime will not last to see its 40th birthday Bolton stated. 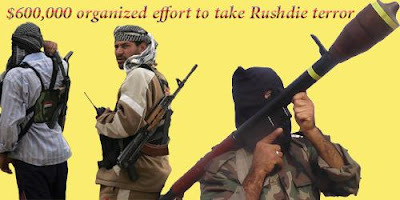 • Before Islamic fundamentalism was recognized as a global threat by the international community. On this day, Khomeini issued one of the first "death Fatwa's" justifying the killing of an author named Salman Rushdie, the writer of "satanic verses"
• Fatwa is a ruling point given by recognized authorities having the role to explain Islam and guide the faithful in modern matters that were not previously tackled by scholars or specifically addressed by the Quran. • the National Council of Resistance of Iran ( NCRI ) exposed the new threat posed by the Iran Revolutionary Guards placing a new bounty on the head of controversial British author, Salman Rushdie. The Iranian resistance’s Grand Gathering in Paris was the event of the year. One of the most important statements was that from the US delegation where they confirmed that the new US government will work with the Iranian resistance against the Iranian regimes mullahs to ensure a free Iran. This statement triggered a chain of incidents orchestrated by the Mullahs in Tehran.